Great news for all you STRONG girls out there. Issue 3 is now out and it's THE BEST ONE YET (or so several readers have told me!). This winter our cover story is "Girls on Fire". Bronnie Mackintosh, from New South Wales in Australia, talks about what life is really like in the modern fire service. Many people think of firefighters as "taming the beast of flames and smoke", but as Bronnie explains, there's so much more to the role than that. On a given day, firefighters may have to "extinguish fire, contain and make safe hazardous materials, extricate people from road crash accidents, search for survivors after earthquakes, floods, and storms, or repel down vertical cliffs to rescue people or domestic animals." Firefighters need problem solving skills, leadership ability, emotional intelligence and conflict resolution skills. Bronnie talks us through a typical day in the life of a firefighter, and we meet Justine, a young woman realizing her dream of becoming a professional firefighter in the modern service. Perhaps the interview I'm MOST EXCITED about in issue 3 is our chat with international survival consultant and celebrity expedition leader, Megan Hine. Megan is one STRONG lady. Her job involves taking celebrity clients into some of the most remote and inhospitable places on earth. She also works in front of and behind the camera on TV shows such as Mission Survive and Bear Grylls: Breaking Point. Bear describes Megan as "Stronger than 99% of men I know" and he's not just talking about her physical strength - Megan is one resilient woman and a fantastic role model for any girls out there wanting to break the mold and follow their dreams. Also in issue 3 we meet Tabitha Sullivan, a young girl and STRONG reader who spent last summer undergoing surgery for her scoliosis. Tabitha's story is one of courage and determination in the face of adversity. See - 64 pages of great articles, interviews, reviews, quizzes and INSPIRATION to EMPOWER girls everywhere! I hope you love issue 3 as much as we enjoyed creating it. Please help us out by spreading word of STRONG as far and wide as you can. We really want this magazine to be available to ALL girls. 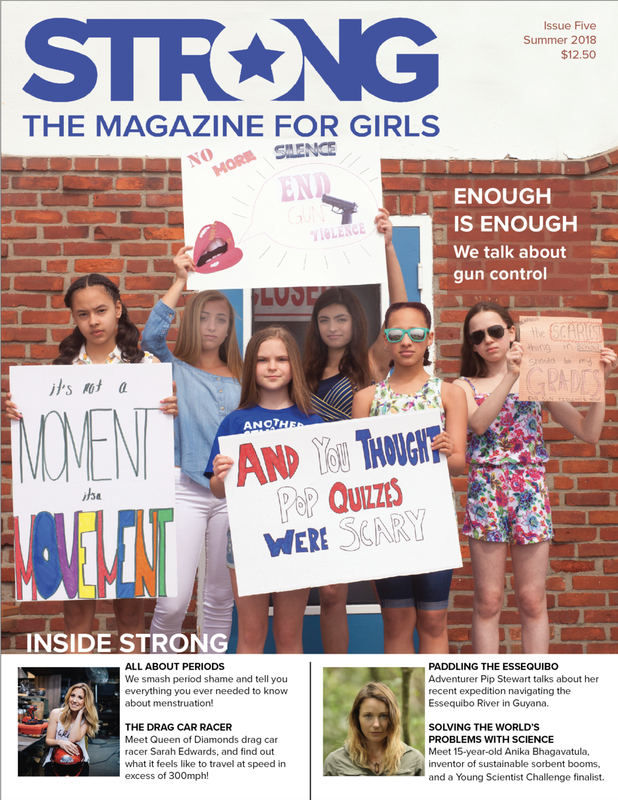 Don't forget, you can subscribe today online at www.strongmagazineforgirls.com or buy your individual copies in select stores in Connecticut (Langs in Wilton and Weston, Winged Monkey in Westport, AR Kids in Ridgefield and Mackenzies in New Canaan). Well folks, a lot has happened in a month and a half! The BIG news is that we ran a successful Kickstarter campaign and we are therefore funded and ready to get STRONG out there to your girls! Thank you so much to each and everyone of you who pledged and backed us, and also to those of you who helped to by spreading the word. Issue 2 is currently at the printers and you can pre order it right now by clicking on the subscriptions page above. The issue is yet again chock full of inspirational articles and wonderful girls and women being themselves and doing what they love. Meet Haley Lubliner, an animal lover who works at a local farm, volunteers at an aquarium and spends her summers working with zoo animals! We also travel to Bremen, Germany, to find out about life growing up in the heart of Europe, and interview Anna Lang, a young woman who works as a wrangler on a dude ranch. We talk about depression and mental health with a wonderful article from inspirational blogger and mental health advocate Lindsay Wheeler, and also feature articles on time management, Hurricane Irma and so much more! Order your copy today! Also, I was fortunate enough to have the opportunity to be interviewed by Ann Nyberg for her show. Click the link to see me talking about STRONG and how important I think this magazine is for all our girls. Thanks again to everyone for all your support. Issue 2 - out soon! Our Kickstarter relaunch has gone live!! Yup, it's true, Tuesday August 29th sees the relaunch of the STRONG Kickstarter! We have a brand new campaign with a new, streamlined (more succinct!) video message. We've also included a link to the digital version of Issue 1 of STRONG so you can all read it for yourselves and see what a great publication this is going to be for our girls! The magazine has come a long way since we launched the first Kickstarter. It's had a new front cover and a design revamp AND we've added more interactive content - something we hope to expand on as more girls read the magazine and send us their photos, stories and reviews. The first time around we raised the profile of STRONG gaining 195 amazing backers who between them pledged $11,500 of funds to help launch our magazine. Sadly, we didn't hit our Kickstarter goal meaning that we didn't get any of your wonderful pledge money. We made the magazine better, revamped the campaign, dropped the funding goal (we're able to do this by opening up online subscriptions and printing fewer copies of Issue 2) and we're ready to put STRONG out there again. We'd love to get as much support as possible within the first 24 hours in order to boost the visibility of our campaign within the Kickstarter community. If you're able, please pledge TODAY!! Please also share Issue 1 of STRONG far and wide. We want as many people as possible to read it and see what we're all about. Subscriptions now available, and check out "Just For Girls"! b) more from girls their own age. We hope to use this part of the website in conjunction with the magazine itself to encourage our readers to interact and to send us stories and pictures about themselves that we can share. For now, it has the summer poll on it that's in issue 1 of STRONG as well as the all important question of the season: "Should there be summer homework?". In Issue 1 of STRONG two girls lay out the arguments for and against and here our readers will get the chance to tell us what they think! From this section of the website girls will also be able to submit reviews for the magazine as well as recipes, tips and photos. In other great news, we have also added a subscription page to the website. As many of you know, we raised $11,500 in pledges from 195 people during the Kickstarter campaign. Sadly, it wasn't enough to reach our goal but we are undeterred! If nothing else, the campaign showed that there are many, many of you out there who think that STRONG is a great concept and would like to see it become a reality. I am regrouping in order to launch another Kickstarter or fundraising project at a later date so please watch this space! For now though, you can purchase a subscription to STRONG! Please log on and click on the link to subscribe. You can now subscribe to STRONG. Once again, a huge thank you to everyone for all your support. I am learning so much as I go on this journey. It is my dream that STRONG becomes a magazine that all our girls can pick up and recognize some element of themselves in. I want them to see other girls just like them doing things they love, being the best version of themselves they can be and contributing in a meaningful way to society. In order to do that I need to hear from the girls themselves, so I hope you will encourage girls you know to log on and get in touch with their great stories! AMAZING NEWS FOR STRONG - WE'RE PRINTING THE FIRST ISSUE! Last night I met with an incredible Wilton resident. Someone who, like me, believes that women are equal, that our girls can achieve anything they set their minds to and that STRONG is necessary to give them confidence to grow up to be the best version of themselves they can be. She wants to help to get STRONG out there and into your hands. So, she is helping me to print and distribute 500 copies of issue 1 of STRONG to be given away free of charge! I am so thankful to have met someone who believes in STRONG and is willing to back us in this way. This is FANTASTIC news! Not only do I get to see STRONG in print, but all you lovely people out there get a chance to actually read it! Also, it means that I can turn my attention to issue 2, which, with the help of our Kickstarter campaign, I will now be able to put out in the Fall. BUT HANG ON, WE STILL NEED YOUR HELP!! We are literally GIVING AWAY the first 500 copies of STRONG to share it with you all and spread the word. Which means that we still need a successful Kickstarter campaign to raise the money to print and distribute the second issue. We have reached 31% of our goal – close to $5000, which is just incredible. Thank you so much to everyone who has pledged to support STRONG so far. But, we still have a long way to go. We have 21 days left of our campaign, and a lot of money still to raise. So PLEASE, if you believe in this project as much as we do, keep spreading the word. Remember, the way a Kickstarter works is that if you don’t reach your goal you don’t get anything. Nothing at all. Not even a dime! If you would like to receive a free inaugural copy of “STRONG. The Magazine for Girls.” Then contact us here leaving your name and address. Thank you once again for all your support for STRONG. 3 days in and 15% funded. Feeling good! I've decided launching a Kickstarter campaign is a bit of an emotional rollercoaster! There's the excitement you feel as you press the big green launch button. Then there's the nerves during the first few hours as you compulsively refresh the page to see if anyone's backed you. Then elation as you get your first few backers-people actually believe in this project-they want to support you! All the while you're getting messages of encouragement and support. You feel pride and a true sense of purpose. Yes, other people can see that there's a need for STRONG, that our daughters need to see women succeeding in all walks of life so they can grow up knowing that they can do and be anything they want to be. You are determined. You WILL succeed. Then there's the reality check. That's a lot of money you're trying to raise. Can you really make this happen-and without advertisements? The Kickstarter experiences a lull; no one's backed you for a few hours. You send out emails and tweets, hoping to gain some momentum, but it doesn't seem to be working. You feel deflated - maybe this isn't going to happen after all. But then, BAM! People start sharing and talking about STRONG again. You check your inbox and people are offering to write for you, offering to help with the layout, offering to connect with you and share the benefit of their experience. More people share the page, some with thousands of followers on social media. More people back you on Kickstarter and you once again feel elation and determination. This IS going to happen. Our girls NEED this magazine. I can DO this! We are 3 days in, and 15% backed. 48 of you lovely, lovely people have put your faith in me and in STRONG and pledged money to help make this a reality. That is incredible and I am so very grateful. THANK YOU. There's still a long way to go on this rollercoaster - so once again, my plea to keep on sharing and talking about STRONG. The links are below. Thank you all for your continued support. It really means the world to me. The front page of our Kickstarter campaign. As of 12.01am this morning, the Kickstarter is LIVE! I am frankly exhausted today after staying up until midnight to press the big "LAUNCH" button but every second counts, right?? And I wanted to maximize the length of the campaign so we get the whole 30 days! and not a second less! I woke up this morning to a wonderful response. 7 backers already - thank you, you lovely people, and several emails from people offering their congrats, and sharing our news on Twitter. 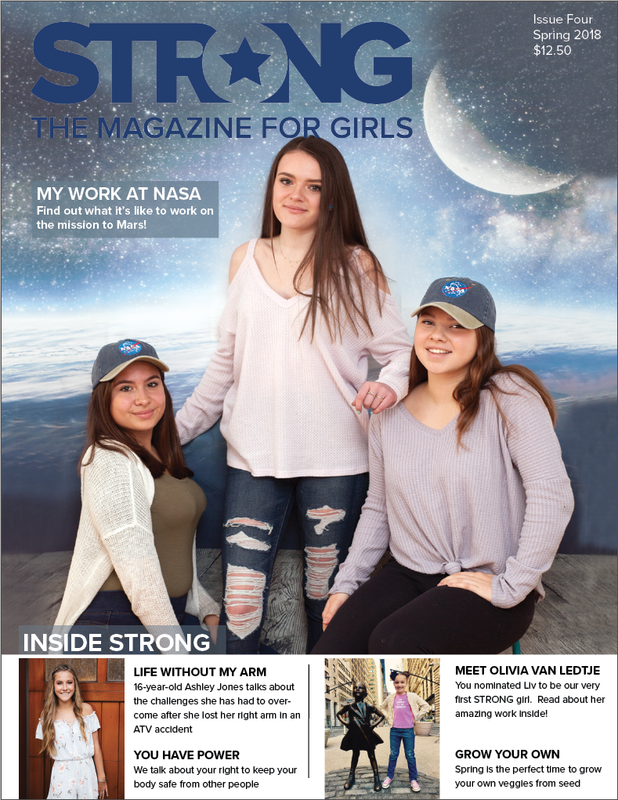 We also had a fantastic article in Good Morning Wilton (https://goodmorningwilton.com/wilton-woman-starts-kickstarter-to-launch-strong-magazine-for-girls) and an offer from a blogger on parenting tweens and teens to review STRONG. So, all in all, a good start to the day! Here's the link to the Kickstarter, people. Please have a look - there's a video I put together and some more information about the article as well as some screen shots of some of the articles in the first issue. Keep spreading the news - 30 days and counting! The cover girl holding up the first (sample) print copy of STRONG! Yesterday was a very exciting day for STRONG as well as for me personally, because we got the first sample copy of Issue One in the mail! I was sooooo thrilled when I opened the package that I actually did a dance around the kitchen. It wasn't pretty. I'm really more of a singer! So cool to see the magazine in print! In EVEN MORE EXCITING NEWS we also got the go ahead from Kickstarter to launch our campaign...... which means we can launch first thing Monday morning! This is both exciting and just a little bit scary as this is where the hard work really begins. As I'm sure you know if you've been following, that gives me precisely 30 days to tell the whole world about STRONG and gather as much support as we can to make sure this magazine actually becomes a reality. Kickstarter have approved our project! Please keep on spreading the word folks! An update on our Kickstarter campaign and a BIG THANK YOU!!! Just wanted to update you all on how things were going with STRONG. I was hoping to actually launch the Kickstarter campaign this week but it turns out you have to submit your campaign for review with the Kickstarter team – makes sense when you think about it! Which means I’m awaiting an email from the lovely people at Kickstarter to tell me it’s OK to launch – and it looks as though that may come towards the middle of next week. In the meantime I’m working hard on my marketing. I’ve written a press release and have compiled a list of bloggers who write on parenting teens and tweens, as well as people and organizations who work to try to empower women and girls, so that I’ll be ready to let the world know once the Kickstarter launches! I’ve also got a couple of interviews lined up to help spread the word. I have been so touched by how many people have reached out to me – offering to write articles to help me publicize the project, offering help with preparation for photo shoots and also putting me in touch with other magazine founders. I’ve had people message me with ideas for articles for future issues and have been put in contact with some amazing women who have inspiring stories to tell and who are keen to write for STRONG and become involved. Thank you all! Please keep all the offers of help coming. I really appreciate them! Also, please keep talking about the magazine and spreading the word. The more people we can tell about STRONG the more likely it is that this magazine will actually make it into print – which would be great for me and just FANTASTIC for all our girls! I’ll update you all again soon! PS - So close to 300 page likes on Facebook! Keep sharing people! Please, please, please, please, please keep sharing the page and talking about the magazine. I really need to create a bit of a buzz ahead of the Kickstarter launch. In case you're not familiar with Kickstarter, the way that it works is that you set a goal that you need to reach-and typically you set that to the minimum you need to "kickstart" your project-and you set a time frame in which to reach it (in our case, 30 days) and, if you don't reach it..... you don't get anything!!!!! I'm setting my goal to $15,000. It sounds like a lot, but I've done the math and with Kickstarter fees and rewards (pledge to support the project and you get some funky STRONG merchandise!) plus the fact that we really want this magazine to be advert free and that as we're starting with a small print run, costs are higher anyway.....it's just what I need to get out a first print run. All of this means that if you think this magazine concept is as fabulous and awesome as I do (and a lot of you do really seem to like it! ), then you need to help by spreading the word! So please, share our page on Facebook, talk about STRONG with your friends far and wide, bring us up in conversation at lunch and dinner, talk to your doctor, your landscaper, your colleagues, your boss, your server at dinner tonight, the person standing next to you in line at the grocery store... tell EVERYBODY about this fabulous new project and get them to follow us on Facebook and check out our website at www.strongmagazineforgirls.com. Thank you again for your support - I'll keep you all posted! Getting ready to go live with the Kickstarter campaign! The idea for the magazine has been bouncing around in my mind for about a year now. I was really busy working on another project until March of this year, so that's when I really started working on STRONG. The more I worked, the more the project evolved and the more excited I became. I'm so excited to being so close to getting this magazine out there! The first issue is ready to go. I have relied heavily on some wonderful friends and neighbors to help me. I've had people writing articles, people copy editing (and oh my they had a lot of work to do - I think I definitely need to pay that person in the future! ), I've had my wonderful photographer friend take photos at a photo shoot for me where the daughters of friends volunteered to model. It's been so much fun and along the way I've received such a positive response. People certainly seem to love the concept of the magazine! I'm working hard to get this website up and running and pull together a Facebook page so that when we launch, people have somewhere to go for more information. I'll keep this blog updated regularly. Thank you so much for visiting and wish me luck!